This book is strictly aimed at business presentations. 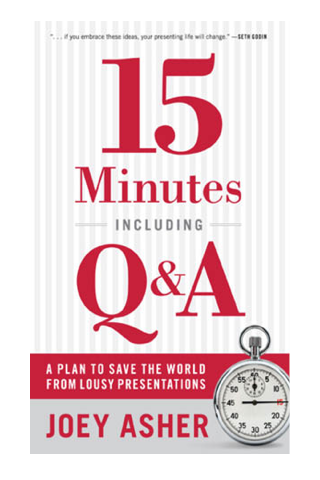 For those, the approach must seem pretty radical: Your presentation should take no longer than seven minutes - the rest (of the 15 minutes) is for Q&A. The author proposes a rather rigid format for those presentations. That's necessary, so that you can keep that time limit and also as a guideline for the presenter to cope with the requirements of this approach. The basic idea is to identify three core points that you want to communicate, and a call to action. Leave out all the details, analysis, background etc. that usually clutter business presentations and makes them such a pain to sit through. If any of that is needed, it can be addressed in the Q&A. I sense a trap that you could fall into when following this approach: Oh, seven minutes of presentation? That's easy ... No, it isn't, and the author acknowledges and addresses that. Not only is it hard work to identify your three core points, but you also have to invest a lot of time coming up with questions that could be asked during the Q&A - and your answers to them. The format sounds intriguing and I can imagine that it will work quite well, if done properly. It is, however, strictly limited to business presentations (and maybe related occasions, where the formula "3 core points + 1 call to action" would fit). It won't help you if you have a fixed time slot to fill, e.g. the typical 60 minutes at a conference. Still, it's a good format to keep in mind in case you have to radically shorten your presentation for whatever reason. If you've done your homework, it should be possible to transform that 60 minute presentation of yours into the 15 minutes including Q&A format on short notice. So even if you're not giving business presentations on a regular basis, this is something that you should add to your toolbox. "Mini Book Review: 15 Minutes including Q&A" by Dirk Haun is licensed under a Creative Commons Attribution-ShareAlike 4.0 International Licence.